Looks like the Sun will be with us for a while this week so we’ve been doing repairs on the UFOHQ perimeter wall (aka the fence) . . . I hope you’ve all faired better through the past storms and had some time to play in the good weather. This Friday we’re at the UFOHQ and Saturday at the Sonoma Valley Woman’s Club. Click the links above for Friday and Saturday details. 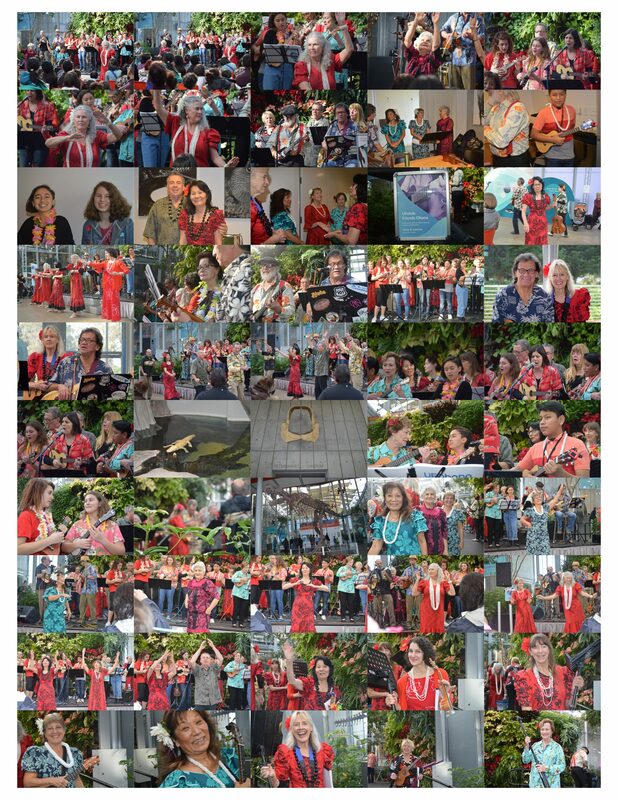 Mucho Mahalos to all that helped make last Friday’s Kanikapila such a fun and well received event for the visiting Elks State President and guests. I hear from Joe and other Elks that the visiting Elks really enjoyed themselves and were quite impressed by all the positive energy (aka Aloha) shared by the UFOhana. Click below to view the action packed photos from that night. Where we had not one, but two (FREE) In A Canoe Hula Lessons! Mahalo Nui to the Elks for the wonderful award (Calabash Bowl below) to PIKOhana recognizing PIKO’s contributions to our local Schools and Keiki. The following Saturday we were treated to a couple of amazing Ukulele and Kihoalu Solos from the Smith Ohana Keiki, Ren and Kai. Click the following to view the album containing the videos. Last Sunday we had a FUNtastic Workshop / Concert with Brittni Paiva! Mahalo to you all for making her feel so welcome, for showing such great support, genuine interest and Aloha to one of Hawaii’s premiere Ukulele Masters. Let’s all hope she visits us again soon. Mahalo Nui Loa Brittni and LeAnn, A Hui Hou! Also want to extend a special Mahalo to Pauline, Dan-O, Susan, Marion, Sandy, Wally, Lopaka, my Ku’uipo Nohea, and many others that helped make this event possible. Mahalo nui ka kou for supporting Brittni on her return journey to the Ukulele. Click below for images and videos from the event . . .
Click above to access the online album. Brittni explains looping and sets up demo song for workshop. Click above to view video. Brittni explains and demonstrates “The Chop” strum. Click above to view video. Brittni’s Concert (approx. 1 hour long) Click above to view video. LInda and Her Chicken . . . Pre-Jake . . .